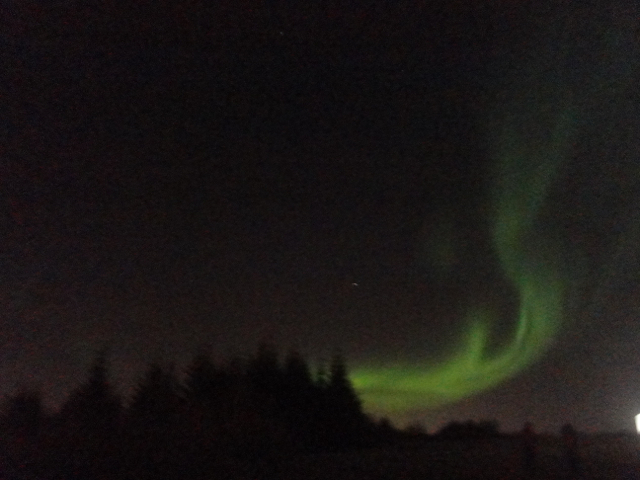 There were only two days of our month in Iceland left and so far the famous Northern Lights had mostly eluded us and we were rapidly losing hope. At the very start of our trip we’d gotten a text message reading “Northern lights alert” from one of the people we’d met in Reykjavik. We’d bundled up and piled out of the red shipping container that passed as our home and right away had caught our first glimpse of the phenomena – three faint strokes of green in the sky. 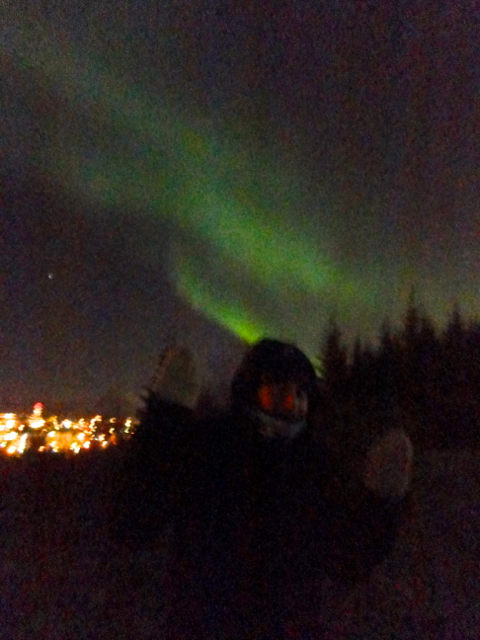 Excited, we ran down to the harbour to escape the streetlights and after a while saw a more intense swirl of green in the sky that danced briefly over Reykjavik then faded away. We waited but the sky remained defiant and nothing that bright appeared again. It had been exciting but too brief and we felt like perhaps we just hadn’t been in the right place at the right time so, the following day, we spent 50 euros apiece in order to be ferried out into the cold darkness of the Atlantic ocean for a better view. We chugged out to sea under a clear and cloudless night and a canopy of stars unfurled above us as the lights of the city receded into the distance. Before long a ghostly, greenish haze appeared in the sky overhead. It faded in and out of view and wasn’t bright enough to photograph, at least not with my basic point-and-shoot. We craned our necks and glared at it for half an hour, willing it to burst into life but the full-on light show we were hoping for never materialised. As we shivered on the frosted deck listening to the guide describe how the aurora can light up the whole sky on a good night we couldn’t help but feel a bit deceived. “In some ways,” she continued, “it’s almost more magical when it is hazy like this.” We looked up and tried to get more excited about the vaguely green mist but the cold eventually got the better of us and we went below deck for a warm drink instead. The aurora – called borealis in the north or australis in the south – is a result of the earth being buffeted by solar wind. A continuous stream of highly charged particles emitted by the sun get trapped in our magnetosphere, drawn towards the poles and then yanked down into our upper atmosphere where they mess around with the nitrogen and oxygen atoms up there, causing them to give off light – most often in green, sometimes red and, rarely, blue. From space this gives the earth the appearance of having a wonky halo around both its magnetic poles known as the auroral ovals – try saying that ten times fast – and it just so happens that the northern oval often hovers over Iceland, making it a good place to catch the action when the conditions are right. Although we’re constantly being pounded by solar wind, it varies in intensity, which is why the aurora isn’t always as brilliant as the abundance of stunning photos we’d seen had led us to believe. 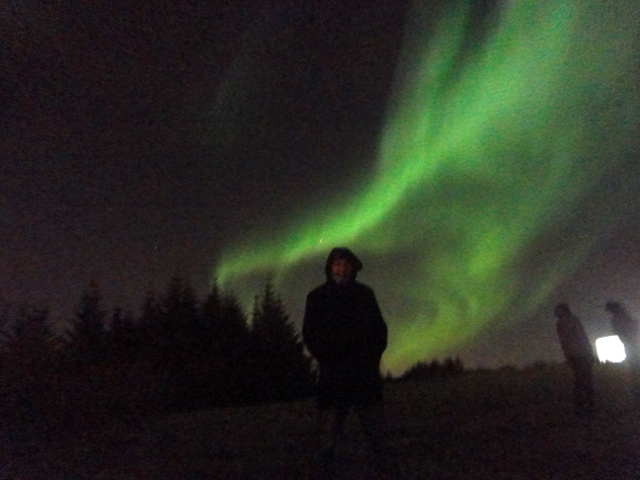 We educated ourselves a bit and learned that auroral activity is rated on a scale of 0 to 9 – the Kp index – with our green cloud barely tipping the scales at a 1 whereas a 9 is a truly rare and spectacular event. We started actively monitoring the forecasts on the Icelandic Met Office and the University of Alaska Geophysical Institute websites and noticed that most days the Kp index was hovering at around 1-2. For us to get a good show, a period of strong auroral activity would have to coincide with a clear, cloudless night sky and, ideally, a small moon. In short, we needed to get lucky. Two weeks passed and it became clear that the frosty but sunny weather of our first week had been a fluke. A thick cover of cloud had enveloped Reykjavik and drizzle became the order of the day. At the beginning of our fourth week, a full-on blizzard hit. We began coming to terms with the fact that our first glimpse of the lights would be our best one and I was already inflating the experience in my memory, ready to try and turn it into a better story. Then, with only a handful of days left in our visit, the clouds departed taking with them the small amount of warmth they had trapped. Arctic winds ripped through the town, leaving a dry and crackling cold in their wake. It didn’t matter though – the sky was finally clear and we were about to get what we’d come to the edge of the Arctic Circle for. The first advance warning came on Friday. Apparently the sun had belched (also known as a coronal mass ejection) and a wave of solar wind was headed our way. We monitored the forecasts constantly to see if and when it would hit and saw the Kp index for Sunday inch up from 3 to 4 and then, as we loaded the sites up on Sunday morning, our most fervent hopes were confirmed – the plasma wave had hit in the early hours of the morning and it was a big one. A “7 – Severe” rating pulsed out of the screen at us. There was just one problem – it was now daytime in Iceland. Twitter was abuzz with sightings. They’d seen it in Alaska and Canada as one would expect but also all over the northern United States, such as in Wisconsin, Minnesota and even as far south as Colorado (to put that in context the north of Colorado is of a similar latitude to Naples, Barcelona and Istanbul). It was the biggest event since our arrival in Iceland and it seemed we were going to miss it because we were currently on the sunny side of the planet. The Kp 7 index, though, persisted into the afternoon and we began to get hopeful that this sun-burp would have enough sustain to last into the night – the only question now was where to watch it from. We didn’t want to spend more money on a boat or bus trip and it was too late to rent a car and get out of town. 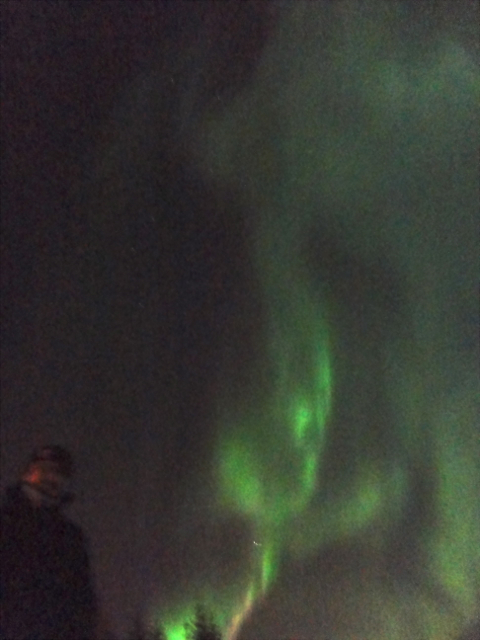 Instead we scoured maps and articles online for dark spots in the city with good aurora-viewing potential. As darkness fell we put on every stitch of clothing we had (the air temperature was a tolerable -6°C (22°F) but the wind was fiercely icy), Stacker pocketed an extra pair of socks to use in lieu of the gloves he had neglected to bring to Iceland and we rushed down to the nearest park. This time the green was everywhere, making arches over our heads that dissolved then reappeared in another place, but the city lights were interfering with their intensity. I was getting antsy and a serious FOMO was setting in – I didn’t want this to be another near-miss. I started freaking out and Stacker and I got into an argument. After much wheadling, I convinced him to start walking to Öskjuhlíð, the wooded hill that stands on the edge of the city – with the sea and the airport behind it, the chances for darkness and a better view was good – but after a few minutes of walking he stopped and refused to budge. 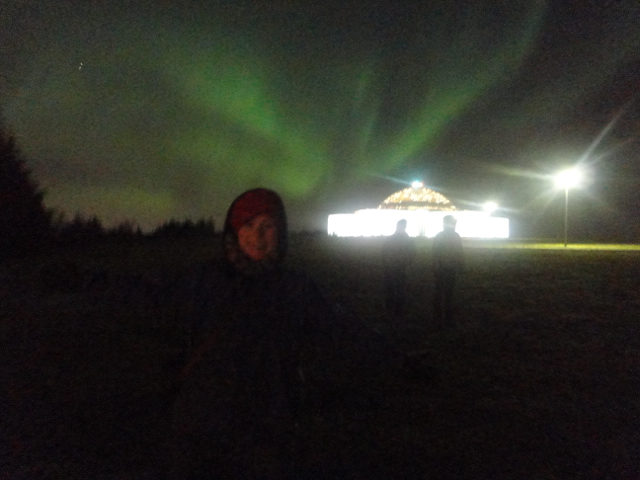 He pointed out the enormous, domed Perlan restaurant on top of the dark hill that was shining like a beacon and argued that we’d take 25 minutes to trek all the way there and it wouldn’t be any better. We stood on the deserted road staring at each other miserably, not knowing what to do and frustrated that we were missing the action. Again. At that moment I heard a bus hurtling up the road and noticed we were standing by a bus stop. I flagged it down and asked if his route went past Perlan, pointing at the hilltop restaurant. He shook his head then thought for a second. “Come here,” he said and I stepped inside, expecting him to give me directions. “Him too,” he said pointing at Stacker. I beckoned to Stacker to step into the bus and, as soon he did, the doors clamped shut and the bus sped off. We had learnt that Icelanders are people of few words and big actions but this was an extreme. I looked around and we were the only ones in the bus. Hadn’t he told us he wasn’t going where we needed to go? I started imagining gruesome ends to our current situation. “I don’t understand where he’s taking us,” Stacker muttered. “Erm, excuse me, erm, where are we going?” I asked. “18 bus,” he replied, pulling out a book of timetables. He started driving with his elbows as he flicked through the book. “In four minutes.” He put his foot down some more. Soon we were at a bus station. “Go there.” He pointed at the 18 bus, waiting to leave. We thanked him profusely and he waved off our attempts to pay but printed us tickets anyway that we would be able to use when we changed onto the next bus. The evening was starting to go our way or at the very least the potential bus driving serial killer that I’d built up in my head had turned into the coolest bus driver ever. The next driver was a lot more liberal with his words and told us all about the restaurant we were headed to, how it was built on top of water tanks and can rotate. I didn’t want to disappoint him by saying we were just going to go up the hill and stand outside it. He dropped us at the stop at the base of the hill, by an unlit footpath leading into a cluster of pine trees. We ventured gingerly up the path into the darkness. It felt like our chances of meeting a gruesome death and being buried in a lava pit were spiking again but at least we’d finally escaped the light pollution of the city. I clutched my trusty Petzl headtorch in my hand, ready to blind any potential attackers. At that moment the lights went quiet for a while and we had just started to despair when suddenly they exploded. We jumped in the air with excitement. Someone was mixing neon green paint in the sky and then painting broad strokes and squiggles over the restaurant, over the city, over our heads and around the moon, which was also glowing brightly. 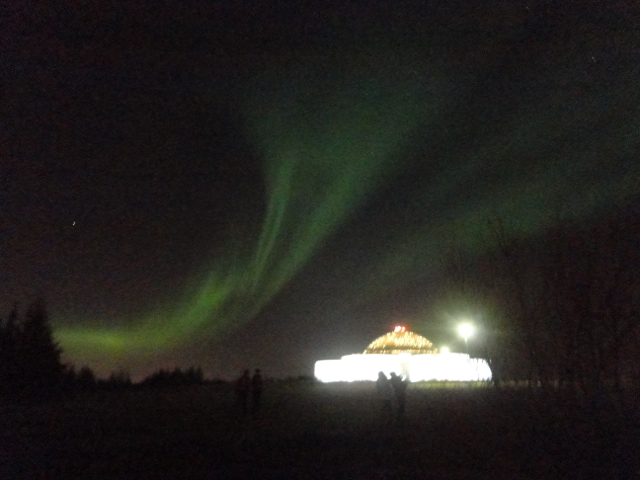 Not an alien spaceship… it’s the Perlan with an auroral backdrop. We stood marvelling, our heads tilted back, rotating in place as the lights danced around us. Stacker clapped his sock-covered hands and I snapped blurry photos until my hand went numb and I had to place it in my armpit to warm up. It was what we’d come to Iceland for and we felt so lucky to have finally experienced it. After an hour, the lights seemed to calm down and we suddenly realised we were freezing, colder than either of us could remember being in a long time. We were still jumping, but now it was from the cold. There was a block of ice where my badonkadonk should have been and my lips had already chapped in the wind. We’d missed the last 18 bus back so we walked the half hour back to the geothermal heat of our shipping container and huddled on the couch under a sleeping bag to relive it through the photos. Nope, we most definitely hadn’t missed out this time. 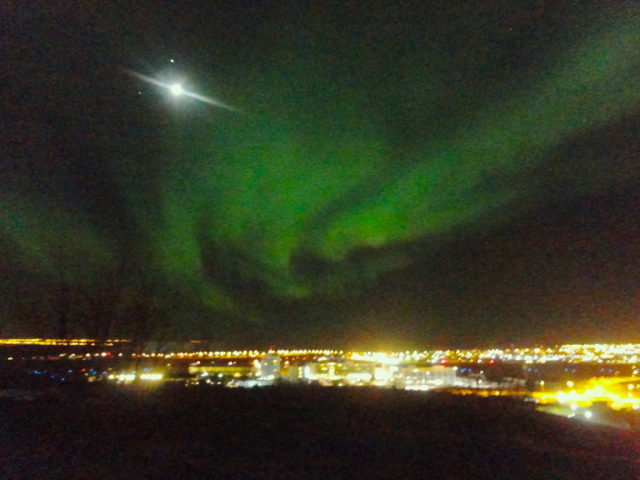 More from the same event (on the 17th March 2013) around the world: Talinn, Estonia, Oulanka, Finland(video), Firth of Clyde, Scotland, Keller, Washington and in Ireland the lights arrived just in time to turn the horizon green on the night of St Paddy’s!